Apple’s revised ad policy ban seems to mean Google’s AdMob is barred from advertising in iPhone apps–and AdMob’s pissed about it. The company responded today. The latest developments in iAds, announced during the Apple Worldwide Developer’s Conference earlier this week, included an updated ad policy that might just ban any iAds competitor. The wording is opaque, but it specifically states that only “independent” ad companies are allowed to advertise on iOS alongside iAds. The collection, use or disclosure [of device or user data] is for the purpose of serving advertising to Your Application; is provided to an independent advertising service provider whose primary business is serving mobile ads (for example, an advertising service provider owned by or affiliated with a developer or distributor of mobile devices, mobile operating systems or development environments other than Apple would not qualify as independent); and the disclosure is limited to UDID, user location data, and other data specifically designated by Apple as available for advertising purposes. The wording seems very intentional: the only “advertising service provider owned or affiliated with a developer of mobile operating systems” I can think of is AdMob, owned by Google, which also makes Apple’s biggest competitor in the consumer smartphone world, Android. This change threatens to decrease – or even eliminate – revenue that helps to support tens of thousands of developers. The terms hurt both large and small developers by severely limiting their choice of how best to make money. And because advertising funds a huge number of free and low cost apps, these terms are bad for consumers as well. It doesn’t seem like there’s all that much Hamoui can do, other than possibly lodging a complaint to the FTC. And the FTC may not be particularly inclined to want to shoot down an AdMob competitor, seeing as how Google’s purchase of AdMob was only narrowly approved. 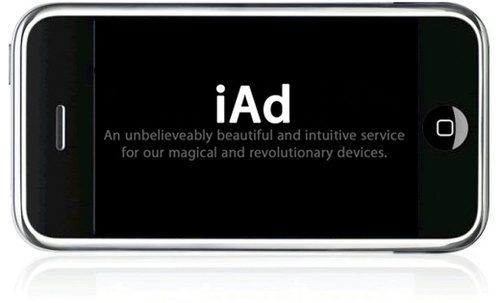 We’ll have to see how this develops–it may come down to the developers, and whether they want to embrace iAds.